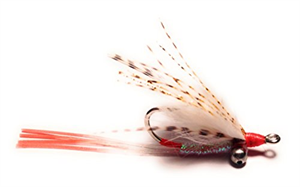 A combination of the Bahama Mama and BoneFish Special Flies. Fishing for bonefish on South Andros Island can really be enjoyable. The best flies tend to have some things in common. Here’s why this one works. 1. It’s light. The problem with most flies that are available commercially is that they’re too heavy. South Andros fish feed in shallow water, so they need to be fairly light. Bead chain eyes are the norm. 2. It’s got legs. South Andros fish love flies with legs. 3. There's a spawn sack. It might not be too realistic, but that bit of orange helps. 4. The fly isn’t too light or too dark. This fly has hackle tips to add a bit of contrast against the bottom. 5. It’s got copper flash. I don't know why it works, but it does...Really well.